Oops, just missed it! This film is no longer available on Netflix streaming or DVD. After bringing you Les Choristes in 2004, Christophe Barratier directs another heart-warming coming of age story in War of the Buttons. Oops, just missed it! This film is no longer available on Netflix streaming or DVD. 24 Days is a shocking and painful experience without a moment to come up for air. Based on the horrifying true events in Paris just 11 years ago, a young man is held kidnapped for an excruciating 24 days, and held for ransom. NOT AVAILABLE ANYMORE TO STREAM ON NETFLIX. NOW AVAILABLE ON NETFLIX DVD. You don't see too many quirky romantic indies that center around the army these days. Thomas Cailley's Love at First Fight follows Madeleine Beaulieu, a young aspiring member of the infantry, wanting nothing more than to best learn how to survive the end of days. Two Days One Night is a classic underdog tale with an uniquely human heroine. Sandra (Marion Cotillard), an unstable wife and mother of two, is tragically flawed, and is made more powerful because of her trembling bravery, and how averse she is to pity. NOT AVAILABLE ANYMORE TO STREAM ON NETFLIX. NOW AVAILABLE ON NETFLIX DVD. Philippe Le Guay's refined Bicycling with Moliere is oddly humorous and human. Even better, it features yet another bang up acting job done by Fabrice Luchini. NOT AVAILABLE ANYMORE TO STREAM ON NETFLIX. NOW AVAILABLE ON NETFLIX DVD. Marriage. Dramatic enough to rival any Shakespearean classic. 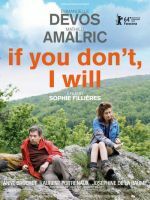 Sophie Fillières' If You Don't, I Will captures the grand finale of the famously challenging union that we all know and love. NOT AVAILABLE ANYMORE TO STREAM ON NETFLIX. NOW AVAILABLE ON NETFLIX DVD. You will never again find a movie quite like Emmanuelle Bercot's On My Way. Only in France will a film follow a French sixty-year-old woman embarking on a road trip in various rural towns for a pack of cigarettes. Oops, just missed it! This film is no longer available on Netflix streaming or DVD. Guillaume Nicloux captures well the ever popular genre mashup of religious and eerie, in The Nun. On the Way to School is a movie about heroes who have no superpowers, but do have outstanding courage and abnegation. This is a tale of sacrifice and friendship that will make you think long after viewing. Being a girl is more complicated than anyone could have ever expected, as made clear by Céline Sciamma's charming, but bewildering Girlhood.